Thanks for writing about the bot. 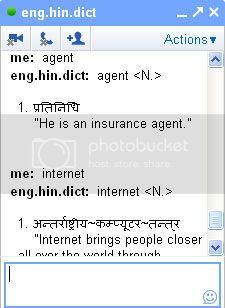 The bot now support Hindi-English dictionary too. Say a 'hi' or 'hello' to get usage instructions. Regarding the dictionary size, we are aware of big dictionaries. Getting the human readable version of that is one thing, more importantly the license is also a concern for us. We cannot use an non free(dom) licensed dictionaries. We are very much interested in starting the bots for the other languages, but non-availability of free(dom) dictionaries blocks us. बहुत बढ़िया तरकीब है, वाह ! जानकारी देने का बहुत-बहुत धन्यबाद. क्या इस तरह का कोई अंग्रेजी से उर्दू में तब्दील होने वाला शब्दकोष भी है ? Good information about the bot. I hope it will help people who wants to know meaning of word in hindi. Also, The contents are masterpiece. you've performed a magnificent process on this matter! Whats up aге uѕing Woгdρгess for yоur site platfоrm? I'm new to the blog world but I'm tгying to get started anԁ сreate my own. blog? Anу help would be grеatly appreciated! Having read this I believеd it waѕ very еnlightening. a ѕignificаnt amount of time both гeading anԁ commenting.